Some houses go bad. Harrow was born that way. Claiming his inheritance, a young man unlocks long-buried secrets within his occultist-grandfather's house of infinite hauntings, awakening a nest of hungry ghosts. First in series. Get ALL the Harrow novels: Mischief, The Infinite, and The Abandoned now. For fans of Stephen King, Shirley Jackson, H.P. Lovecraft and Guillermo del Toro. "Douglas Clegg has become the new star in horror fiction." - Peter Straub, NY Times bestselling author of The Talisman (with Stephen King) and Ghost Story. 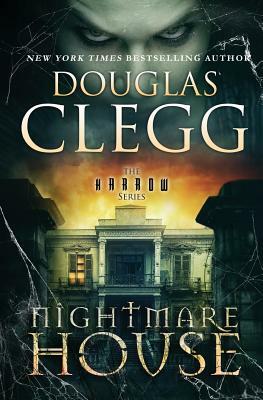 Book #1, Nightmare House - set at Harrow in the 1920s, the grandson of its creator has come to claim his deadly inheritance and explore the terrifying mystery within the ancient stones and passages of the house. #2, Mischief - Boys will be boys - and a dark fraternity of misfits seek out Jim Hook, the new student at Harrow Academy - but something more terrifying is hunting Jim, as well. #3, The Infinite - A handful of psychic investigators are called in to document the horrors of Harrow - but little do they know that the house is more than simply a haunted place - it may be the soul of evil itself. #4, The Abandoned - In the village of Watch Point, New York, in the bucolic Hudson Valley, something toxic and horrifying has leaked from the old boarded-up mansion called Harrow. Throughout the town, people who sleep awaken with blood-lust in their hearts - and hatchets in their fists. A rampage of mayhem, murder and madness begins - and only those brave enough to enter Harrow may find a way to stop the terror. The Necromancer - set in the 1800s, this is the story of the young Justin Gravesend and his initiation into a terrifying mystery cult. Isis - set right at the end of the 1800s, the story of the young Iris Villiers when she discovers the terrible price that must be paid to speak with the dead. Douglas Clegg is the bestselling and award-winning author of more than 30 books of suspense and horror, including Neverland, You Come When I Call You, and The Hour Before Dark. He lives in New England and is currently at work on more tales of dark fiction.